Poppet's Window: Bohemians and Bugs... but no Dictionary. Bohemians and Bugs... but no Dictionary. 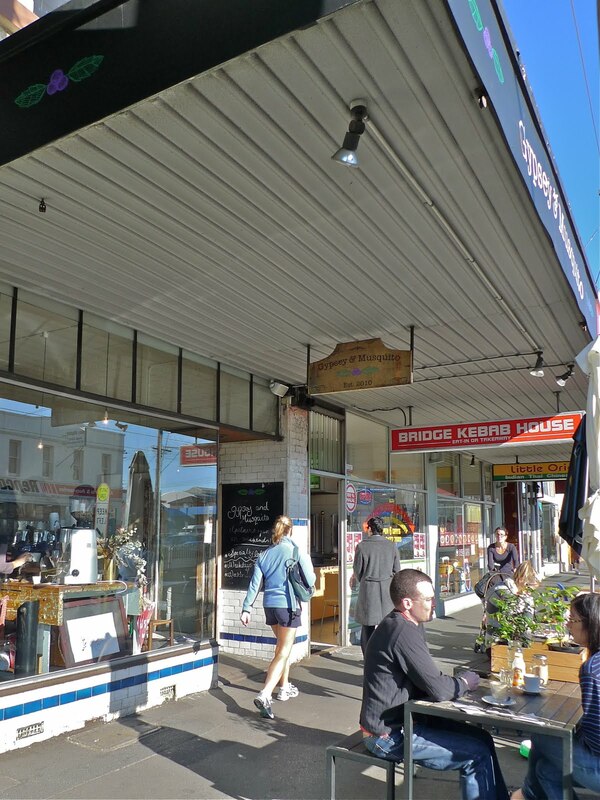 In the hustle and bustle of Bridge Road, Richmond, it is easy to race past this attractive cafe. While shoppers dragged down by garish plastic bags speed-walk by, time stands still for those seated outside who are warmed by the rare winter sun. White walls provide a backdrop for rustic-looking ornaments including decorative jars, stainless steel buckets, rusty bells and wooden crates posing as shelves. The coffee machine is positioned by the door to facilitate a quick transaction when ordering take-away coffee. Next to the busy machine, a wooden, farmhouse-white stand supports a sparkling glass display cabinet. Behind the clear shield perfect rows of cakes and pastries are flaunted. The over-sized lamingtons, lemon meringue pies and homemade muffins still nestling in their baking trays are impressively presented. If you are seeking something more substantial, the savoury selection outnumbers the sweets three-to-one and the large display cabinet was still groaning with colourful, fresh produce at 11am on a Saturday. With a selection of sandwiches (happy bacon & egg, double-smoked ham and cheese, alpine pepper roast beef and caramelized onion, and organic chicken avocado); savory tarts, veggie pies and sausage rolls; pastry boxes stuffed with everything from slow roast lamb shoulder to organic chicken and creamed sweetcorn; mushroom and native forest croquettes; roast pumpkin and spinach ricotta bakes; tuna patties; and a selection of gourmet salads with locally sourced ingredients, it is a wonder the menu refers to this extensive range as "this n' that in the chiller." 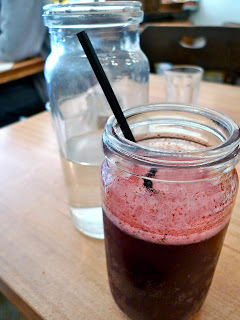 The Five Senses coffee is decent and strong, but was overshadowed by the 'Blue Tongue Lizard,' served in a Fowlers Vacola jar. Made from crushed blueberries, Preshafruit apple juice and mint, the refreshing beverage felt like an instant detox and was nothing less than delicious. A word of warning: do not order on a first date, you are almost guaranteed to get blueberry bits stuck in your teeth! Each menu item includes at least one, true-blue Australian ingredient. Whether you choose breakfast with a side of Wallaby or Crocodile sausage, Tasmanian salmon or smoked Paper Bark oil and bush tomato chutney, Gypsey and Musquito gives you a reason to feel patriotic. We sampled the potato and herb hash served beneath crispy, free range bacon with two poached eggs and topped with a creamy Lemon Myrtle hollandaise sauce (see first image). The soft mash was a wonderful take on traditional hash browns while the Lemon Myrtle flavour added a refreshing zest to what would otherwise be a rich and heavy sauce. I ordered "Anna's granola" of oat clusters with wattleseed, macadamias and bush berries roasted in apple juice. It came served with pure water buffalo yoghurt, which was dense but not too sweet, and a drizzle of nectarous Cradle Mountain honey. A few poached pears and strawberries constituted the 'summer fruit compote' and left much to be desired. Although the granola itself was crunchy and tasty, the serving was tiny and not a good option if you are ravenous. But as the saying goes, "quality over quantity." While most reviews of this establishment criticise cold service, we encountered no problems. That being said, the staff were brisk and efficient rather than warm and welcoming. However, Gypsey and Musquito is a great place to try something a little different that is still close to the city and 'au naturel.' If the place seems packed when you arrive or the communal table up the back is not to your taste, keep in mind there is an upstairs area as well. I will be back soon to try the cakes!